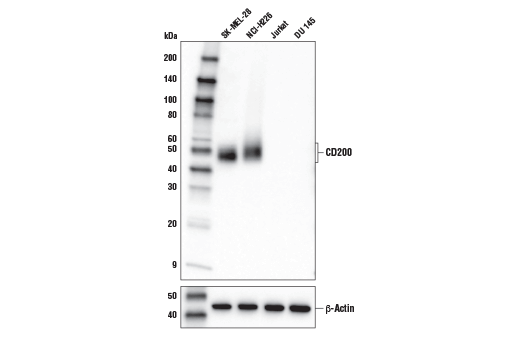 CD200 (E2K4C) Rabbit mAb recognizes endogenous levels of total CD200 protein. Monoclonal antibody is produced by immunizing animals with human CD200 recombinant protein and reacts with an epitope surrounding Pro189. Western blot analysis of extracts from various cell lines using CD200 (E2K4C) Rabbit mAb (upper) or β-Actin (D6A8) Rabbit mAb #8457 (lower). Immunoprecipitation of CD200 from SK-MEL-28 cell extracts. Lane 1 is 10% input, lane 2 is Rabbit (DA1E) mAb IgG XP® Isotype Control #3900, and lane 3 is CD200 (E2K4C) Rabbit mAb. 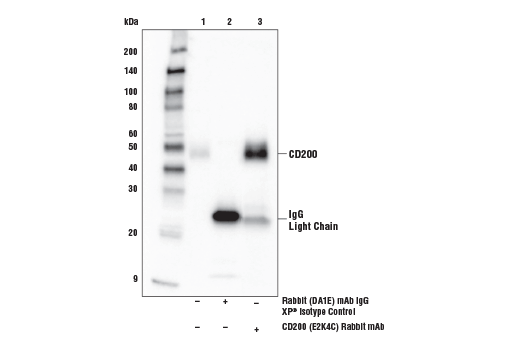 Western blot analysis was performed using CD200 (E2K4C) Rabbit mAb as the primary antibody and Mouse Anti-Rabbit IgG (Light-Chain Specific) (D4W3E) mAb (HRP Conjugate) #93702 as the secondary antibody. 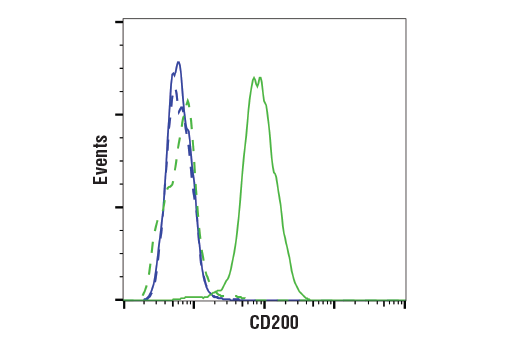 Flow cytometric analysis of DU 145 cells (blue) and SK-MEL-28 cells (green) using CD200 (E2K4C) Rabbit mAb (solid lines) or a concentration-matched Rabbit (DA1E) mAb IgG XP® Isotype Control #3900 (dashed lines). Anti-rabbit IgG (H+L), F(ab')2 Fragment (Alexa Fluor® 488 Conjugate) #4412 was used as a secondary antibody. 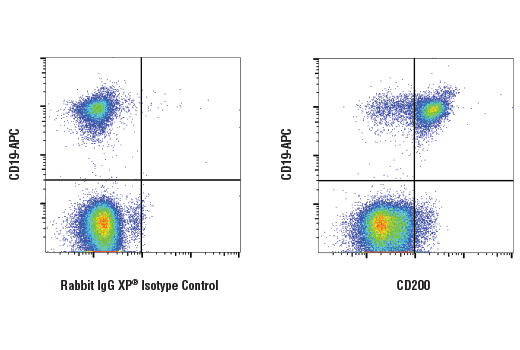 Flow cytometric analysis of live human peripheral blood mononuclear cells, using CD200 (E2K4C) Rabbit mAb and co-stained with CD19 (SJ25C1) Mouse mAb (APC Conjugate) #31943 (right), compared to concentration-matched Rabbit (DA1E) mAb IgG XP® Isotype Control #3900 (left). Anti-rabbit IgG (H+L), F(ab')2 Fragment (Alexa Fluor® 488 Conjugate) #4412 was used as a secondary antibody. Cells within the lymphocyte gate were used for analysis. CD200 (OX2) and CD200R (OX2R) are membrane glycoprotein members of the Ig superfamily (1-3). CD200 is expressed by a range of cells, including neurons, epithelial cells, endothelial cells, fibroblasts, and lymphoid cells, while its receptor, CD200R, is found on myeloid and T cells (1-5). Interaction between CD200 and CD200R downregulates macrophage function and plays a role in immunosuppression and regulation of anti-tumor immune responses (3-7). Barclay, A.N. (1981) Immunology 44, 727-36. McCaughan, G.W. et al. (1987) Immunogenetics 25, 329-35. Wright, G.J. et al. (2000) Immunity 13, 233-42. Hoek, R.M. et al. (2000) Science 290, 1768-71. Wright, G.J. et al. (2003) J Immunol 171, 3034-46. Kretz-Rommel, A. et al. (2007) J Immunol 178, 5595-605. Fallarino, F. et al. (2004) J Immunol 173, 3748-54.